Leslie Geddes-Brown has discovered all manner of things to do with garlic. It’s rare to discover a taste that’s completely new to you, but this year I did—at my local farm shop. It’s garlic jam. At first, I was put off by the name, thinking of strawberry jam on bread and butter. Garlic jam for tea? Definitely not. However, it actually isn’t that kind of jam— think, instead, of cheese, crackers and unsalted butter. Or cold roast ham and, I’m afraid to say, just a spoonful when no one’s looking. Garlic jam is quite sweet and the garlic taste is more a suggestion than a shouted command. Very, very good. I had originally thought it came from a long-lost 17th-century recipe, but no, it was invented by the Boswell family, who run The Garlic Farm on the Isle of Wight —up to 30 acres of land dedicated to all things garlic. 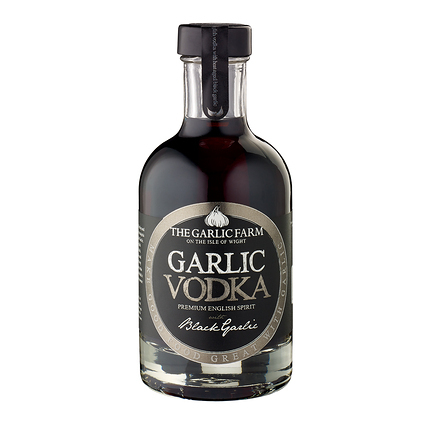 As well as the jam, they have more than 60 products, such as pickles, chutneys, oils and butters and, most recently, Black Garlic Vodka (which I’m too scared to try). Managing director Natasha Edwards, eldest daughter of Colin and Jenny Boswell, who run the farm, says: ‘A lot of recipes come from Mum’s kitchen.’ Among these have been Vampire’s Revenge, a hot plum chutney, and, a favourite of mine, smoked garlic butter. You can also buy smoked garlic bulbs (£2.50), which are surrounded with oak chipping fumes for 48 hours and are delicious in a traditional gratin dauphinoise, and black garlic (a tub of peeled cloves is £4.95), slowly heated until it turns a sinister black. Mix it with soy sauce to use as a salmon or chicken glaze. The Boswell family also encourage growing your own garlic, recommending their Solent Wight, the most adaptable; Picardy Wight, which puts up with a cooler and wetter climate; and Mersley Wight, bred from an Auvergne variety. You can get a pack of all three for £14.95 (I have). It’s still fine to plant them, although it should be done by mid March. Natasha thinks that the farm is the largest in Britain and was started by ‘Granny Norah’ Boswell more than 50 years ago. The island, one of the most southerly parts of Britain, is good, because garlic likes both sun and plenty of daylight. Except, of course, wild garlic, which grows like a weed in woodlands. Ransoms or Allium ursinum, called because bears like to chew its leaves, is a true British wild plant and can be foraged in shady woodlands, but you’ll need to get permission first. It’s not only bears that like A. ursinum—I do, too. In spring, I’m frustrated by acres of the broad green leaves thrusting through the leaf mould in unattended wildernesses, but I’ve never dared actually pick them. I do grow some of the bulbs for their leaves in a wet, shady part of our garden, but nothing like enough. Try the wild-garlic soup I found in Switzerland made with leeks, potatoes, stock and cream cooked and blended. If you put handfuls of garlic leaves in at the last minute before blending, the liquid becomes a delightful leafy-green colour. Leaves also work as a herb and, as you will see if you buy a Yarg from the Cornish Lynher Dairies, it can be used as a natural outer coating for cheese. It’s strange to think that, in the 1950s, garlic was considered a nasty foreign incomer, most suitable to hold in front of the fangs of a vampire, should you happen to meet one. Recipes nervously recommended rubbing the salad bowl with a clove, but not, certainly not, using them whole along with the lettuce. Now, chunks of them are considered essential and, as The Garlic Farm has discovered, also as a background ingredient in other dishes. I like to imagine the large Boswell family at work in their kitchen inventing new garlic ideas. Meanwhile, I’m off to have some Yarg cheese with garlic jam.